Ever since I laid eyes on the star stitch, I have been wanting to learn it and make it into one of my crochet dishcloth patterns. 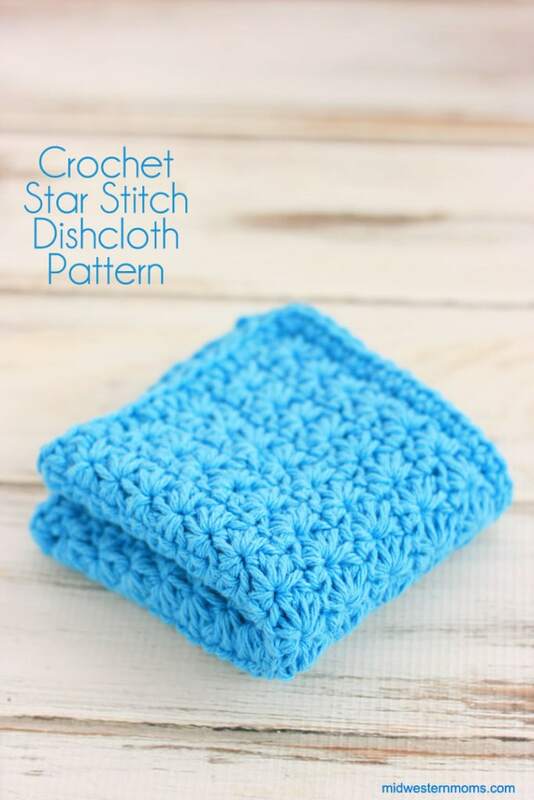 This star stitch crochet dishcloth pattern looks like it would be hard, but once you get the hang of it, it is quite simple. I kept putting it off thinking it was going to be difficult. When I finally got around to trying it out the star stitch, I was amazed at how simple it was to do. 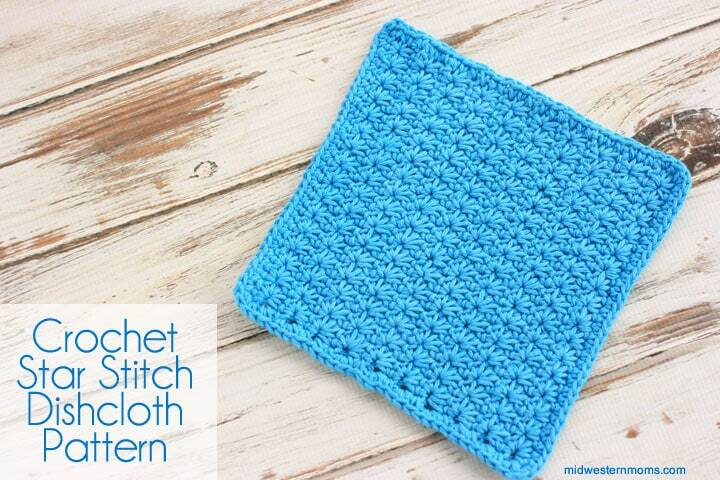 I think the star stitch makes for a very pretty dishcloth (or bathroom washcloth). I only use 100% cotton yarn. Acrylic yarn is not as absorbent as cotton. Plus it is scratchy. Don’t want to risk scratching delicate glassware and dinnerware. Usually, one ball of cotton yarn will be enough to make one dishcloth. 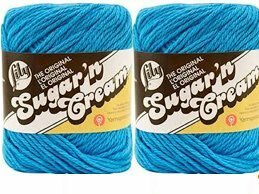 If you use an ombre color, you may need a second ball of yarn to complete your dishcloth. 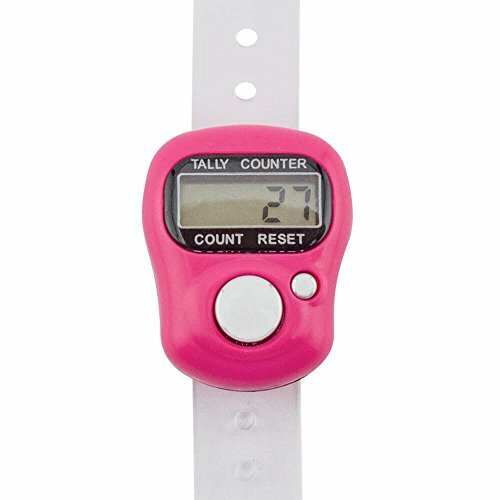 I have started to use a digital row counter and I love it! So, if you need help keeping track of your rows, grab up a counter. Important: This pattern has 2 rows that repeat, one of star stitches and one of single crochet v-stitch. In the pattern the star stitch is a multiple of 2+1, then add 3 chains for the foundation. For example: I want my first row to have 16 star stitches. To find out how many foundation chains I needed I did a little math: 16×2+1+3= 36 chains. Each star stitch will be made over 2 stitches. For the remaining stitches, please follow the “remaining star stitches” until you have completed 16 total star stitches. Finish with a double crochet in the same chain as the last star stitch spike. Turn your work. Chain 1. Single Crochet 2 stitches into the chain 1 of each star stitch, single crochet the top of the chain 3 at the end of the row. (you will have: 16 single crochet v’s, plus the chain 1 at the beginning and 1 single crochet at the end) Turn your work. Chain 3. Insert your hook into the 2nd chain from the hook, yarn over and pull up a loop; Insert hook into the 3rd chain from the hook, yarn over and pull up a loop; Insert hook into the 1st stitch, yarn over and pull up a loop; Insert hook into the 2nd stitch, yarn over and pull up a loop; Insert hook into the 3rd stitch, yarn over and pull up a loop, With all 6 loops on your hook, yarn over and pull through all 6 loops. Chain 1 to close the stitch. Continue to star stitch following the “Remaining Star Stitches” instructions until you have 16 total. Finish with a double crochet in the same chain as the last star stitch spike. Turn your work. Repeat Row 2 and 3 until you reach 20 total rows. Chain 1. Single crochet around your dishcloth. You will put 1 single crochet in the single crochet rows and 2 single crochets in the star stitch rows. Make sure to put 3 or 4 single crochets in your corners to make them rounded. I just love that color! It is gorgeous design! I love this pattern. I’m going to give it a try!! I’ve always wanted to learn how to make these! I would love for you to link up to the Stitch It, Blog It, Share It Link Party going on now at BehindtheSeamsSewing.com. I love that you provide videos with your tutorials. I am a beginner at crochet and still have a hard time understanding the written patterns. Thanks! You’re Welcome Harmony! I like to see things as well so that is why I do that. Thank you for stopping by! I wish I was coordinated to crochet. Thanks so much for linking up this week at #HomeMattersParty. Can’t wait to see what you link up next week. Oh My word….I love this pattern…I have never seen it before, but I now HAVE to try it! Thank you so much for sharing! I love this pattern and the utility of it. However, your video showed the active/crucial part your stiching OFF the camera. Most of the time only the dangling chain was visible while your hands worked off(above) the screen of focus. It would be nice if you could find someone to actually, actively focus, recording you doing this. Beautiful when done. I am going to give it a shot as well. I have never seen this pattern before except possibly in tatting to make doilies. I admit my recording skills are not the best yet. I need a better set up. Many thanks from France for this tutorial. I think I have now understood (?) how to crochet the “star stitch. Thanks! Great directions–they were very clear and easy to understand. I’m fairly new to crocheting and really enjoyed this project. It’s such a fun stitch! I’ll be giving one of these as a Christmas gift and hopefully making one for myself after the holidays. Thank you! I love this stitch. Your directions and video were very clear and helpful.